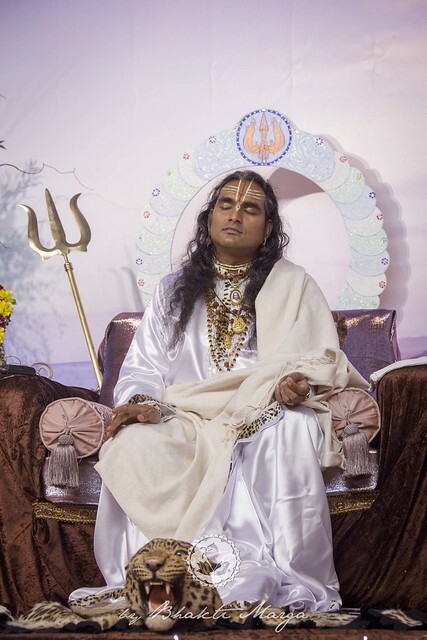 Paramahamsa Sri Swami Vishwananda / Bhakti Marga: Shivaratri: A first time experience. A few days ago, I had the enormous good fortune of attending Shivaratri at Shree Peetha Nilaya. Visiting here from the USA, and only meeting Swami for the first time a few months ago, everything is pretty new to me. I thought Shivaratri would just be a simple event; it turned out to be an all-night, unforgettable experience. Now, I have to admit, I've always been kinda scared of the image of Shiva, but then again, all I knew was that he was dark blue, wore snakes around his neck, sat there, unmoving, on an animal skin, and destroyed stuff. A pretty limited understanding, to be sure. Strangely enough, my spiritual name is Gauri (wife to Shiva) and my husband's spiritual name is Shankar (the benevolent aspect of Shiva). So this event had the potential to hold a lot of personal insights, even though my own knowledge about it was embarrassingly little. Feeling like I was responsible for finding out more about our namesakes, and thanks to the wisdom given by several residents of SPN, I decided to get some basic knowledge of the event, and not wait for Swami to explain everything for me. (Apparently he is known to say things like "...but I told you this last time, so I won't repeat myself..." and I didn't want to miss out on some vital info.) So, I referred to Swami's Just Love 3 book to help me understand what all the fuss was about. Several chapters are devoted to Shivaratri there and Swami explains in detail the meaning and significance of each phase of the celebration. I learned that Shivaratri is a day devoted to honoring the deity responsible for transformation. Most people think of Shiva as the Destroyer (in the trinity of Brahma/Vishnu/Shiva or Creator/Maintainer/Destroyer), but I learned that there is a secret that he holds: he is not responsible for just an "ending" but is the only one that makes possible a new beginning. He is responsible for transformation, and because of that, he is kind, generous, and always giving. I also learned that the whole point was to devote the day to remembering and thinking of Shiva and to allow this special process to affect a transformation in ourselves. It was all about surrendering the mind and dissolving the ego. The day began early. Really, really early. 3:30 am for me at least, in order to get ready for the first yagna ceremony at 5:00 am. Through the day there was an anticipation of what was to come that evening. Beginning at 6 pm, the entire proceedings were interesting and insightful: nearly constant singing Shiva's name and praise; hours of puja, yagna and abhishekam ceremonies; seeing Swami come in and guide the proceedings and lead the singing; eating prasad after every offering; moving in and out of the Big Temple in waves of devotees from around the world; and most importantly, as we offered to the Shiva Lingam at the front of the room, consciously offering our ego and limited mind to Shiva himself, and asking for purification of our limitations. As the night went on, I felt as if I was getting more and more...well, "flexible" is the only word that comes to mind. I felt less tied to responding to things going on around me in the same way I always had, and was more aware of new options. I was also very conscious of my judgments about other people, and noticed how those judgments actually felt like poison inside me. (Is it a coincidence that Shiva himself drank poison to save the world?) Fortunately, the rhythm of prayers, singing bhajans, and offering it all up to Shiva seemed to have a cleansing effect that went deeper and deeper each time. When the day had dawned, I had made it. And now that I think of it, it was easy. So that's what they meant about Swami would help me! Naturally and effortlessly the energy flowed through the night, and allowed the best possible outcome. I felt lighter and different. As if something had shifted, but was so deep that there was no evidence on the surface....not yet, at least...but still, something about me felt new. Shankar and I went to bed at 7:30 AM with morning light streaming in the windows, and an entirely new appreciation of Shiva in our hearts. Thank you Shree Peetha Nilaya, and of course, endless gratitude to our beloved Guruji.